Welcome and thank you for dropping by! We enjoy having guests visit our website and we would love to know a little about you and where you're from. Will you do us a favor and please sign our online Guestbook before you leave and let us know if you have found our site helpful. If you have danced with us on a Friday night or met us somewhere else on a dance floor, please let us know. Just click the Guestbook tab on the left or the animated guestbook above and hit "Post" to leave your comment. Thank you and have a great day! Don't forget to check back for updates. Are you looking for a place to learn and dance line dance? The Waxhaw Line Dance Club opened its doors on January 6, 2012, at the Waxhaw American Legion located at 801 East South Main Street, in Waxhaw, North Carolina. This is a fun and friendly line dance club for both beginners and seasoned dancers alike. The club is for all ages and all levels. We strive to be family friendly. Please see our guidelines for fun and safe dancing. My husband David and I have looked for a place to dance since our move from Indianapolis in 2005. There weren't as many choices as we thought there would be, nor as many as we had in Indy. We wanted a place where we could share our love of music and dance and have an enjoyable time. After dancing here and there for a little bit, we decided we wanted something more permanent. 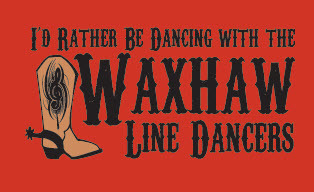 It was decided Waxhaw would be a great place to do some line dancing. Did you know that dancing can give you a great mind/body workout? It is a perfect way for people of any age to get cardiovascular exercise! It reduces stress while lowering blood pressure and cholesterol as well as improving strength and muscle tone. It also helps stimulate the mind which can help ward off Alzheimer's disease and other dementia. Read more about the benefits here. Line dance is friendly and social. No boots required! You don't need a partner and no experience is necessary. Age is not a factor and you can even have two left feet! You can do it - even grandma and grandpa can do it - it's fun for the whole family. Line dancing is repetitious so the more you practice the steps, the more skilled you will become. Join us for some good music and great fun and meet new friends in the process! The Club dances every Friday night at the Waxhaw American Legion Hall located at 801 E. South Main Street. The doors open at 7 PM. The first hour is dedicated to Absolute Beginner and Beginner steps and lessons. We will then go into improver/intermediate lessons at 8 PM followed by open dance until close. We teach a new dance (sometimes two) every week. The new dance is then reviewed for two more weeks for a total of three weeks at which time the dance goes into rotation for our open dance session. Of course if it is a more difficult dance or our dancers need more instruction, we will continue to review it until we feel ready to add it to our open dance repertoire. We encourage our dancers to speak up during the lesson if anyone has a question about the steps or having difficulty with any portion of the dance to ensure everyone has a good time and doesn't get frustrated. Remember, there are no silly questions and we are all here to help each other. Admission - $5.00 cover for line dancing all night long. First timer? Your $5.00 admission gets you a coupon to get in FREE your second visit. What do you have to lose? Line dancing today is done to all sorts of music, not just country. There are very traditional dances to country music as well as not so traditional dances to non-country music. Line dancing now uses more than just the "stereotypical" country music, in fact line dancers dance to most styles of music: country as well as modern pop, Irish, Latin just to name a few. We dance to a variety of music from country to the Atlanta Pops with a sprinkling of Jennifer Lopez, Pitbull, Cher, Lady Gaga, The Beach Boys, Billy Joel, Bruce Springsteen, John Mellencamp, Big Mucci, Scissor Sisters, Gloria Estefan, Etta James, Engelbert Humperdink and Maroon 5 for starters. There is something for everyone! Bring your dancing shoes and join us! Boots, dance sneakers, or leather soled shoes are best to dance in. Tennis shoes are acceptable, but harder to pivot and slide in. For some suggestions on dance sneakers, check the tab to the left labeled "What do I wear?". Hope to see you on the dance floor in Waxhaw! For more information, please call 704-559-9808, or e-mail us. **Check out our other pages on the tabs for photos, dances and videos. Visit us often for updates and please sign our Guestbook.